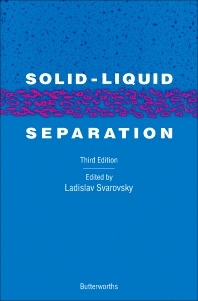 Solid-Liquid Separation, Third Edition reviews the equipment and principles involved in the separation of solids and liquids from a suspension. Some important aspects of solid-liquid separation such as washing, flotation, membrane separation, and magnetic separation are discussed. This book is comprised of 23 chapters and begins with an overview of solid-liquid separation processes and the principles involved, including flotation, gravity sedimentation, cake filtration, and deep bed filtration. The following chapters focus on the characterization of particles suspended in liquids; the efficiency of separation of particles from fluids; coagulation and flocculation; gravity thickening; and the operating characteristics, optimum design criteria, and applications of hydrocyclones. The reader is also introduced to various solid-liquid separation processes such as centrifugal sedimentation, screening, and filtration, along with the use of filter aids. Countercurrent washing of solids and problems associated with fine particle recycling are also considered. The final chapter is devoted to the thermodynamics of particle-fluid interaction. This monograph will be useful to chemical engineers and process engineers, particularly those in plant operation, plant design, or equipment testing and commissioning. It can also be used as a textbook for both undergraduate and postgraduate students.